The importance of a thorough evaluation when managing a patient who may suffer from either a synovial hemangioma or a synovial chondromatosis of the shoulder. Department of Research, University of Missouri, Kansas City, Missouri, USA,3Department of Pathology, University of Missouri, Kansas City, Missouri, USA. Department of Orthopaedics, Truman Medical Center, University of Missouri, 2301 Holmes Rd., Kansas City, MO 64108, USA. Introduction: Synovial hemangioma is a developmental hamartoma of vascular tissue within the synovium; no cases involving the shoulder girdle have been described in the literature. Synovial chondromatosis is a benign condition in which synovial cells undergo metaplasia into hyaline cartilage, and is also thought to infrequently affect the shoulder region. Case Presentation: A 44-year old female presented with left shoulder pain of seven years duration. Magnetic resonance image (MRI) displayed a 2.5 x 2.5 cm lesion in the anterior glenohumeral joint, with hypointense T1- and hyperintense T2-weighted signal and peripheral and septal enhancement. Arthroscopic biopsy of the synovial-appearing mass led to a histologic diagnosis of synovial hemangioma. Successful embolization was performed, and repeat arthroscopy then revealed a white consolidated mass at the subscapularis recess. After en bloc excision, histologic evaluation was consistent with synovial chondromatosis. At 6 months, she denied any pain or limitation in her shoulder. Conclusion: Synovial hemangioma has never before been reported to involve the shoulder region. Histologically, engorged inflammatory vessels secondary to a mass effect are identical to a hemangioma. The clinician should be aware that synovial chondromatosis or other masses may compress synovial vessels and histologically mimic a hemangioma. Synovial hemangioma is a developmental hamartoma of vascular tissue within the synovium. It most commonly presents in the second decade and can be a cause of pain and recurrent atraumatic hemarthroses. The vast majority of published cases have involved the knee joint. To our knowledge, a case of synovial hemangioma involving the shoulder has yet to be described in the literature. Synovial chondromatosis is a benign condition in which synovial cells undergo metaplasia into hyaline cartilage and may ossify. Any synovial-lined tissue, including joints, bursae, and tendon sheaths can be affected. The incidence of synovial chondromatosis is low, and it is thought to infrequently affect the shoulder region. We present an unusual case of synovial chondromatosis of the shoulder, with the histological concomitant presence of synovial hemangioma. The patient was a 44 year old female with atraumatic left posterior shoulder pain of 7 years duration. The patient was employed as a janitor, with movements such as lifting and reaching forward exacerbating her symptoms at work. She was left hand dominant with no history of prior medical co-morbidities, and was a non-smoker. There was temporary relief, yet no permanent resolution, of symptoms with anti-inflammatorie medications and exercise. Examination of the left shoulder revealed moderate atrophy of the musculature of the supraspinatus and infraspinatus fossae. Active and passive range of motion was 150 degrees of forward flexion, 10 degrees of external rotation, and internal rotation limited to 20 degrees. There was no palpable mass, tenderness, nor crepitus about the shoulder girdle. Plain radiography of the left shoulder joint was interpreted as being normal. A non-contrast magnetic resonance image (MRI) of the shoulder revealed the presence of a lesion measuring 2.5 cm in cross-sectional diameter in close proximity to the superior labrum, protruding anteriorly into the subcoracoid recess. The lesion displayed lobulated complex hypointense T1- and hyperintense T2-weighted signals (Figures 1a, 1b). The humeral head also displayed subchondral erosive changes posterolaterally. The rotator cuff was structurally intact. A repeat MRI was obtained with infusion of intravenous gadolinium contrast dye (Figure 2). This showed peripheral and septal enhancement of the lesion. Differential diagnostic considerations included a complex paralabral cyst, synovial inflammation and hypertrophy, and a possible neoplasm. A decision was made to proceed with arthroscopic biopsy of the lesion. Arthroscopically, the mass was visualized as a significant amount of red, reactive synovial tissue at the anterior aspect of the glenohumeral joint, located near the rotator interval (Figure 3). Basket forceps was used to obtain a biopsy. There appeared to be no abnormal tissue involving the biceps brachii tendon, the subacromial space, and subdeltoid space. Histologic evaluation by an experienced musculoskeletal pathologist determined that the biopsy specimen consisted of fragments of synovial membrane with thick-walled blood vessels and scattered lymphocytes (Figure 4). A diagnosis of synovial hemangioma was made. At the next office visit, the patient noted continued pain in the left shoulder with activity, and excision of the mass was recommended. Due to the risk of hemorrhage that can complicate hemangioma excision, referral was made to vascular surgery for pre-operative embolization. 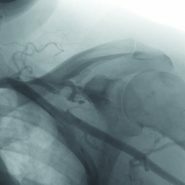 During angiography, the vascular surgeon identified a branch of the subclavian artery extending into the lesion. A selective angiogram of the vessel was performed revealing a radiographic blush consistent with hemangioma (Figure 5), which was then successfully embolized with biosphere beads. Two weeks later, a repeat shoulder arthroscopy was performed, again demonstrating the anterior hemorrhagic synovium. This time, the anterior synovium was debrided, revealing a white consolidated soft tissue mass at the subscapularis recess extending medially under the coracoid (Figure 6). A complete excision through the arthroscope was deemed not possible, and thus a limited open deltopectoral approach was performed. The lesion measuring 4x3x1 cm was excised en bloc near the coracoid base. The specimen was evaluated histologically, revealing nodules of hyaline cartilage, specifically nests of mature chondrocytes with nuclear atypia set within fibrous tissue (Figure 7). This was consistent with synovial chondromatosis. The patient reported subsequent improvement in pain and range of motion following the surgery and structured physical therapy. At her 6 month office visit, she denied any pain or limitation in her shoulder. This case exemplifies the challenges encountered when establishing the diagnosis of synovial processes about the shoulder joint. This is in part due to the rarity of these conditions. Synovial hemangioma has not been previously described involving the shoulder region in the literature. The condition most commonly affects the knee, with over 200 case reports. Other areas of involvement include the ankle, elbow, finger, and temporomandibular joints[4, 6]. While also rare, there are reports of synovial chondromatosis involving the glenohumeral joint, biceps tendon sheath, and subacromial bursa. Bloom et al. reviewed the literature in 1951 and noted 10 out of 191 cases involved the shoulder. Milgram et al. more recently reported 6 cases involving the shoulder out of 30 total cases of synovial chondromatosis. In our case, the diagnosis of synovial chondromatosis was established as a relative certainty after en bloc excision. Yet the presence of a concomitant synovial hemangioma remains in question. The initial biopsy specimen (Figure 4) was reviewed by the pathology department board at our institution, and while it is consistent with hemangioma, the histology may also be compatible with engorged subsynovial vessels secondary to a mass effect and mild inflammation. It has been noted that synovial hemangioma can resemble normal vessels to such an extent that controversy exists as to classify them as malformations, tumors or hamartomas. The blush seen by the vascular surgeon during angiography further confounded our case: the hemangioma may have decreased in size following embolization, or the blush simply represented normal engorged vessels adjacent to the synovial chondromatosis. The imaging characteristics of our case suggest the presence of a single lesion, most compatible with synovial chondromatosis. Synovial chondromatosis has variable MRI features, depending on the chondral and osseous content of the lesion. Unmineralized lesions, which account for 16% of cases, display low/intermediate signal intensity on T1 weighting and high signal intensity on T2 weighting7. MRI features of synovial hemangioma also include homogenous low intensity on T1 sequence, and heterogeneous high intensity with low-intensity septa within the lesion on T2 sequence. However, gadolinium contrast can be helpful in distinguishing between the two. Following contrast administration, synovial hemangiomas demonstrate avid homogenous enhancement, while synovial chondromatosis displays peripheral enhancement, as our case demonstrated. This is now the second case reported showing mimicry between synovial chondromatosis and synovial hemangioma. The prior report was of a 2-year old female with a posterior right elbow mass. Pre-operative imaging included rounded calcific densities on plain radiographs, with peripheral and septal enhancement on gadolinium-enhanced MRI. In their report, the working diagnosis after imaging was synovial chondromatosis, until excisional biopsy revealed a cavernous synovial hemangioma. The accurate diagnosis of masses involving the synovium of the shoulder region can be difficult to the surgeon, pathologist, and radiologist alike. While this may be the first reported case of synovial hemangioma involving the shoulder girdle, compression of synovial vessels by chondromatosis may also produce this histology. The clinician should be aware that synovial chondromatosis or other masses may compress and inflame synovial vessels and histologically mimic a synovial hemangioma. 1. Adelani M.A., Wupperman R.M., Holt G.E. Benign synovial disorders. J Am Acad Orthop Surg. 2008;16(5):268–275. 2. Amita K.R., Rajani R., Shankar V., Shobna S. Synovial hemangioma of the knee joint: A rare case report. Internat J Med Res Heal Scien. 2014 Jan: 3: 448-450. 3. 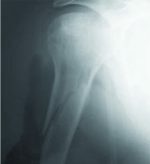 Bloom R., Pattinson J. N. Osteochondromatosis of the hip joint. J Bone Joint Surg Br. 1951;33(1):80–84. 4. Bruns J., Eggers-Stroeder G., von Torklus D. Synovial hemangioma – a rare benign synovial tumor: Report of four cases. Knee Surg Sports Traumatol Arthrosc. 1994; 2:186-9. 5. De Filippo M., Rovani C., Sudberry J.J., Rossi F., Pogliacomi F., Zompatori M. Magnetic resonance imaging comparison of intra-articular cavernous synovial hemangioma and cystic synovial hyperplasia of the knee. Acta Radiol. 2006 Jul;47(6):581-4. 6. Devaney K., Vinh T., Sweet D. Synovial hemangioma: a report of 20 cases with differential diagnostic considerations. Hum Pathol. 1993; 24(7): 737-45. 7. Kramer J., Recht M., Deely D.M., Schweitzer M., Pathria M.N., Gentili A., Greenway G., Resnick D. MR appearance of idiopathic synovial osteochondromatosis. J Comp Assist Tomogr. 1993; 17(5):772–776. 8. Milgram J. W., Hadesman W. M. Synovial osteochondromatosis in the subacromial bursa. Clin Orthop Relat Res. 1988;(236):154–159. 9. Neumann J.A., Garrigues G.E. Synovial chondromatosis of the subacromial bursa causing a bursal-sided rotator cuff tear. Case Rep Orthop. 2015: Mar 12: 259483. doi: 10.1155/2015/259483. 10. Ogawa K., Takahashi M., Inokuchi W. Bilateral osteochondromatosis of the subacromial bursae with incomplete rotator cuff tears. J Shoulder Elbow Surg. 1999;8(1):78–81. 11. Sanchez T., Wong S., Swischuck L., Carmichael K. Synovial hemangioma in a 2-year old mimicking synovial osteochondromatosis. Open J Radiology. 2012: 2, 22-4. 12. Sasho T., Nakagawa K., Matsuki K., Hoshi H., Saito M., Ikegawa N., Akagi R., Yamaguchi S., Takahashi K. Two cases of synovial haemangioma of the knee joint: Gd-enhanced image features on MRI and arthroscopic excision. Knee. 2001;18(6): 509-11.